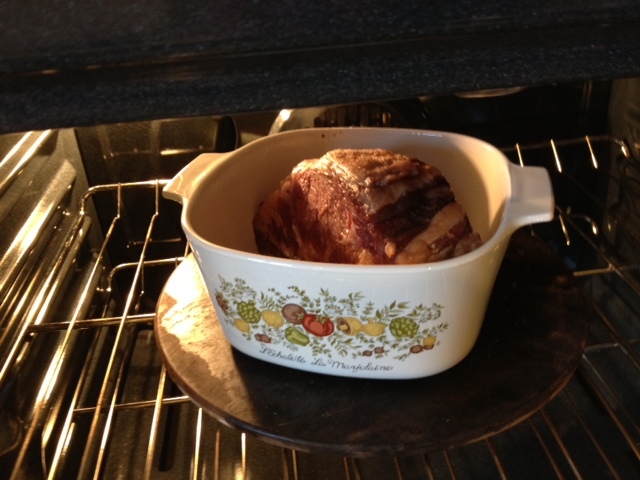 We have been looking for the perfect prime rib recipe. Something perfectly medium rare, with a nice crust, that is easy to prepare... with a two year old running around. A set it and forget it recipe, if you will. Ideally, a recipe that could be applied to a big roast if we were having company, but that could also scale down to feed 3 people with minimal leftovers, if we were so inclined to have it for a nice family dinner. This Boxing Day, we were so inclined. OK, so it was less about Boxing Day and more about us being too tired from returning from travel on Christmas Eve to actually shop, prep, and make something nice for Christmas! Fast forward one day, and we were ready to get our cook on again. In the past, we've tried sous vide with a blow torch finish, which was an awesome end product, and met the easy recipe requirement (and really, who doesn't like to cook with a blow torch?!? 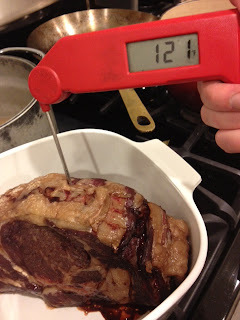 ), but quite honestly, all that time in the Food Saver bag (which is not officially designed for sous vide, and our contraption is nearing 8 years old), made me nervous that the seal would break we would end up with prime rib soup. Though Prime Rib Soup sounds like it has potential, we needed something slightly less anxiety causing. 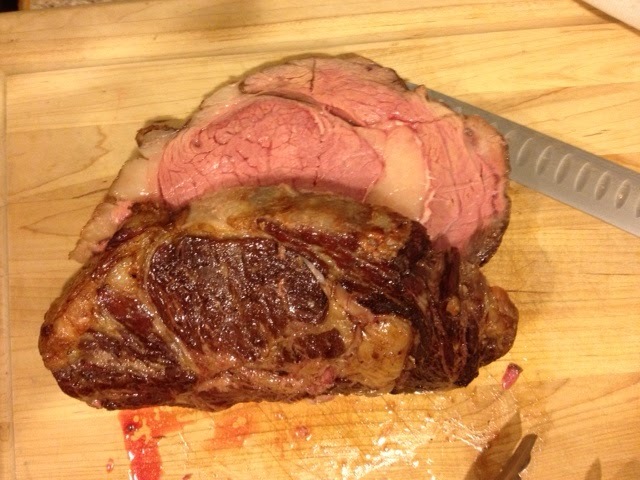 So, after drooling over the Food Lab recipe for Perfect Prime Rib, we decided to give it a whirl on a smaller-than-suggested scale, with excellent results! It met the easy peasy requirements (salt, bake on low, rest, increase temp, bake more, eat), required minimal attention throughout the day, allowed for distractions by shiny objects, and came out lookin' evenly cooked like something from the HOPR (minus the zeppelin). 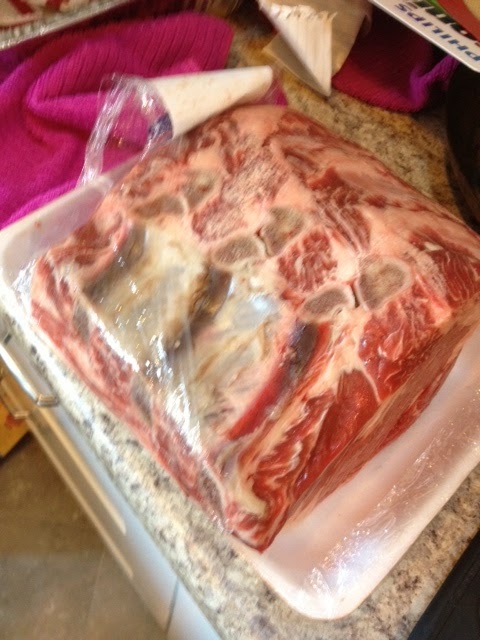 We purchased the smallest Choice rib roast we could find at Costco (a little over 7 lbs, 3 bones), and cut it into thirds (one bone, about 2+ lbs each), which gave us a hefty, but not unreasonable piece of meat. And at $8.99/lb, the price was somewhat reasonable for a fancy dinner for 3, with leftovers. The other two parts were food saved (an officially approved Food Saver use), and frozen for future use. 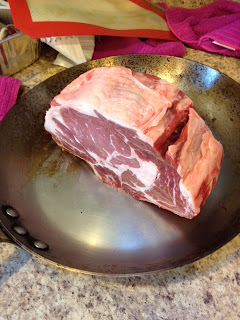 The Prime rib roast was about 2x the cost, and looked amazing, but for now, we're rolling with Choice. Perhaps we'll upgrade someday when our money trees start to bear fruit, but until then, Choice was perfectly acceptable for our needs. The meat was salted, and put into a pan (initially a large saute, but then transferred to a smaller Corningware so it could be centered in the oven), and roasted at 170 convection (the lowest our oven will go). I would like to say I salted it 45 minutes in advance, and brought the meat to room temp first, but well, I didn't. I figured the low heat would be more forgiving on those sorts of things. The end product did not suffer because of my laziness. The meat roasted for about 4 hours, being checked for proper temp during the last hour to ensure we didn't over cook. Finally, we reached 120 (or 121 in our case). And we set it aside to rest for 30 minutes (which turned into an hour). Then, we fired it for 10 minutes at ultra-uber-super-hot. And it crackled and spurted and made all kinds of delicious noises. And TA-DA, it was done! A perfect medium rare with a crust to die for. Success!